This Program Is Not For Everyone. It Is For Serious Players Only. If You're A Wannabe, Lookie-Lou or A Whiner, This is NOT For You. Whereas all other sales programs teach you to be aggressive, salesy and slimey techniques. I show you the opposite right in the first week. This is the week where youll see how you NEVER need to be pushy at all especially when it comes to high-ticket sales. In fact, the less pushy you are, the more successful youll be. This is the ONLY program you will find where you get these high high-level strategies at this price point. Typically, Fortune 500 companies pay TENS of THOUSANDS of dollars for one afternoon of this type of training. Youre getting it at a small investment and you get to practice USE it in real life by the end of the program. Youve met people who spend months, sometimes years, trying to become great public speakers. -yes? Im sure youve also met people who speak really naturally on their first speaking engagement. Its the same thing in sales. Youll find most sales people take months to close a deal. What you get in this week is the secret to close in ONE single call. You will NEVER find these scripts on Google or any sales training. These are the holy scripts which Ive developed over the years which has helped me close millions in sales over the phone. With these scripts, you will never be phased by any client, prospect or sales conversation again no matter how intimidating the person youre talking to is. close someone. Imagine never getting rejected again. Well you dont need to imagine because youll know how to turn around any conversation at any time with this weeks strategies. What youll see is the more resistance your prospect gives you, the more power you have over him. And the more easy you can close someone. In this week, you get your hands dirty. The gloves comes off and youll be practicing your moves LIVE in front of your class before dealing with REAL life clients. The best performers in this week will get to work with my clients. In this weeks lesson, I will also show you how to get your own clients. This is one of the MOST important classes in the program. 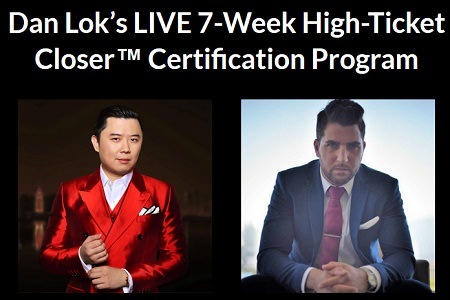 In this class, youll discover the quickest and easiest way to make 6-figures as a High-Ticket Closer. This includes how to structure win-win deals with your clients. The 4 requirements every one of your clients must meet for you to make money for the long-term. And much, much more. All times are GMT +6.5. The time now is 10:47 PM.